This turned out to be a rather interesting issue because of its dual nature. On the one side we have the confrontation between Maria Hill and the school’s teachers, which gets quite heated and involves a lot of plain and subtle threats both. On the other side we have two new students to the school getting their welcome tour and they experience a slice of the completely wild life of the school, whether that be the students themselves or the teachers or some of the other things like the school’s automated defenses. Its a wild ride through and through. What I enjoyed most about this issue was the confrontation. Its one where neither Director Hill nor the school teachers back down from their stance and there is a lot of open hostility between the two camps. What helps this entire sequence stand-out was Hill’s dialogue. She acknowledges everything that the X-Men have done to save the world, over and over again, but she also makes it clear that she doesn’t trust them and thinks them as powder kegs waiting to blow up since they have also almost destroyed the planet several times. Add to that all the time travel and resurrection shenanigans and Hill often gets a headache when it comes to resolving any situation with the X-Men. Of course, we saw a slice of this during the event as well, when Hill was made aware of the most recent time-travel occurrences at the school and those opening pages of Uncanny X-Men #12 are one of the best in the entire events. Where it comes to the X-Men, SHIELD has nothing but frustrations to face. The second story arc here was interesting because of how much it shows off the diversity of the school, but against the previous half of the issue, it felt like too sudden a shift in tone and mood. Part of the reason is because Aaron doesn’t mix the two arcs together, but completely divides the issue in two halves. Its not an approach that worked for me. If the two arcs had been mixed up a little, then the issue would have read better, overall since the tone would be much more consistent. The second half also involves a very confusing characterisation of Iceman, who was pretty normal in the first half. That was another shift that didn’t work for me. The reason given is extremely thin, and involves a reference to the end of the Battle of the Atom event, and it just came off as gratuitous. They needed some filling for a few panels and they decided to go with this. The art in this issue is by artist Pepe Larraz, colourist Matt Milla, and letterer VC’s Clayton Cowles. Giuseppe Camuncoli was the penciller on the series for the Battle of the Atom (at least), and I have to say that in comparison, I don’t find Pepe Larraz’s art all that good. He has anatomical inconsistencies here and there and he draws somewhat of a weird Logan and Storm as well. The latter has the world’s weirdest flowing mohawk. Too stylistic and flashy I’d say. Not bad per se, but the art in the previous two issues was pretty good, and this one kind of pales in comparison. However, Matt Milla does a fairly good job with the colours, and he makes everything look really vibrant, which was just as well, considering that the series is in a rebound phase after the recent event. So, overall, not all that bad off an issue, but not too great either. Could have been better, certainly, and I look forward to the next few issues, since the series is supposed to be cancelled quite soon with Jason Aaron moving off elsewhere to focus on his other books. More Wolverine and the X-Men: #36, #37. 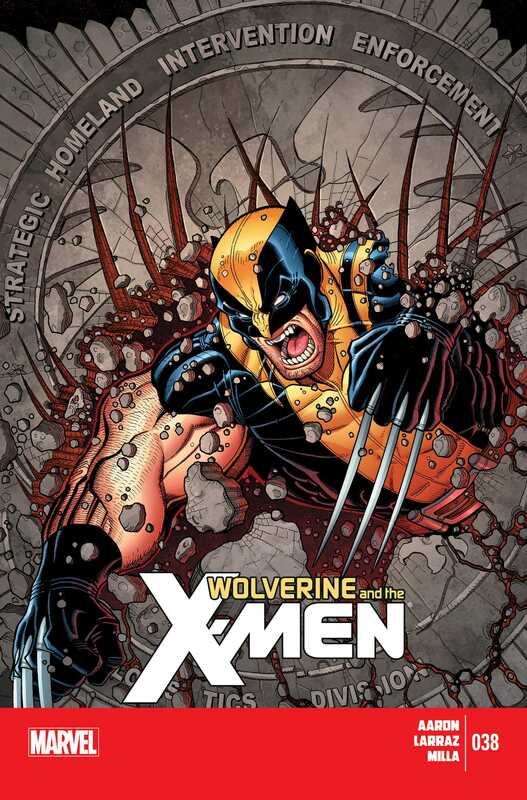 Posted on December 2, 2013, in Comics Reviews, Review Central and tagged Battle of the Atom, Comics, Comics Review, Jason Aaron, Maria Hill, Marvel, Marvel Comics, Matt Milla, Pepe Larraz, Review, Review Central, SHIELD, Storm, VC's Clayton Cowles, Wolverine, Wolverine and The X-Men, X-Men. Bookmark the permalink. 2 Comments.